Are You Being Harassed by Debt Collectors Calling and Writing Constantly? Are You Afraid to Answer the Phone or Open the Mail? 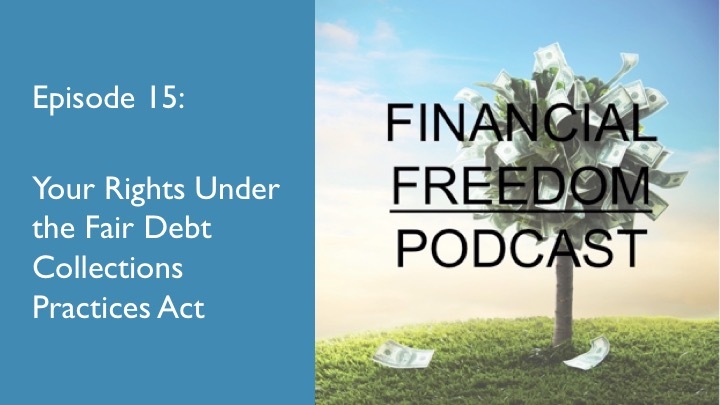 Then Learn in This Podcast Episode How to Fight Back Under Federal Law! Find Out How to Make It Stop! People in financial difficulty are often hounded by debt collectors trying to get them to pay. Although the constant barrage of phone calls and letters is bad enough, many times these collectors will use harassing and intimidating tactics in order to be the squeakiest wheel and get to your money first. Dealing with this can be very stressful and add to the overall desperation of those deep in debt. But fortunately, there is federal law in place to protect you from this type of harassing behavior and even give you a basis to sue the debt collector for damages and attorney’s fees! It is called the Fair Debt Collection Practices Act, and it is a powerful weapon against unethical and unscrupulous debt collectors. In this episode, I talk about how this law can be your sword and shield against harassment.